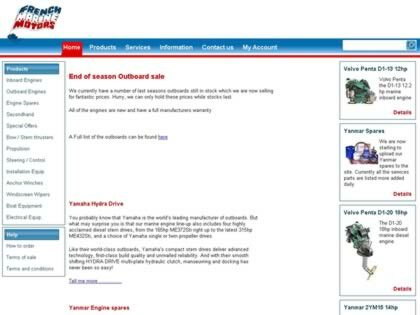 Web Site Snapshot: If available, above is a snapshot of the French Marine Motors Ltd web site at http://www.frenchmarine.com as it appeared when this site was added to the directory or last verified. Please Note that Boat Design Net has no involvement with the above web site; all content and images depicted in the above thumbnail are the property and copyright of French Marine Motors Ltd unless otherwise noted on that site. Description: We specialise in all aspects of Marine engineering including the supply of new marine engines, reconditioned marine engines, spare parts, propellers, stern gear and engineering chandlery. Our well stocked and equipped facilities allow us to provide you with a one stop solution to all your marine needs.